Pneumatic tool supply hose, or Jackhammer Hose, can add risk of hazards and injury to the job site. An unchecked out of control hose can be dangerous to the operator and to bystanders alike. A hose coupling blow-out can become a deadly projectile. Luckily there are a number of safety products available to help to mitigate the risk from these hazards. 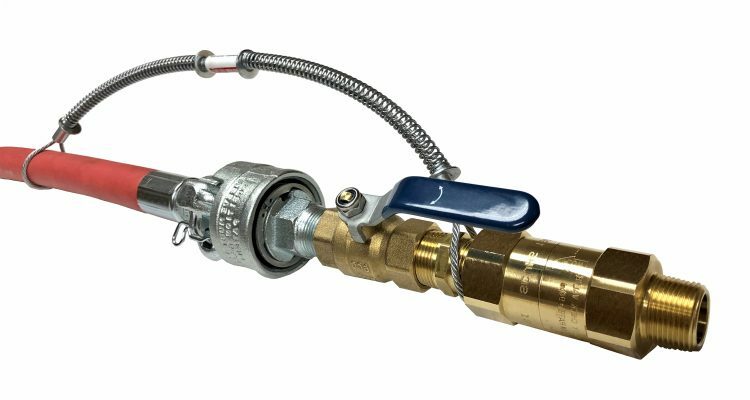 A complete hose safety system includes a number of products as well as proper education and regular inspection. An OSHA compliant safety check valve at the air source (compressor, manifold, or air receiver) will sever the air flow if a surge is recognized. A surge in air volume signals that a hose is severed. Once the air beyond the check valve escapes, the hose lays limp rather than hazardously flying around until it can be captured. Hose safety whip check cables, choker cables, or nylon safety restraints, should be installed at every hose connection, including at the air source and the hose to tool end. These devices, when selected and installed properly, will hold the hose in ‘check’ until all air escapes. Proper selection includes ensuring that the pressure rating of the cable is beyond the peak system pressure, and that the size range fits the hose properly. Correctly install the devices by pulling them fully extended down the hose line rather than around the hose coupling. If they are installed at the hose coupling, the hose may slip out of its grasp rendering it useless. A properly selected hose coupling, and a well assembled brand name air hose round out a well designed safe pneumatic system. Make sure that the hose coupling is secured using safety clips, and rated for the peak pressure of the system. Chicago type couplings are rated at 150 PSI regardless of the higher pressure rating stated on most air hose. Higher pressure and sleeve retractable coupling options are available. Inspect the condition of hose assemblies and all other items in the system regularly. Ozone and jobsite abuse will wear down a hose over time. Check that any field repairs have been done correctly and are holding up well. If the hose coupling twists inside the hose or any of the hose shank is exposed, repair or replace the assembly. Education is equally important with a well designed hose system. Understanding that coupling disconnection can be caused by vibration could increase the value of safety clips to the operator. Learning that whip check or choker cables will not keep a hose in check if they are installed too close to the hose coupling could be the difference between injury and a quick repair. Ensure that all operators are aware of the purpose of the system’s safety components and how to properly install them. Education should include how to conduct a thorough inspection and what to do in the event that an issue is found. Retire a hose from service before a blow out occurs. *OSHA 29 CFR 1926.302(b)(1): Pneumatic power tools shall be secured to the hose or whip by some positive means to prevent the tool from becoming accidentally disconnected. Additionally 1926.302(b)(7) states: All hoses exceeding ½-inch inside diameter shall have a safety device at the source of supply or branch line to reduce pressure in case of hose failure.